When you embark on a quest for a new mattress, you're bombarded with a head-spinning array of mattress features to choose from. There are varying coil counts and thread counts, as well as latex foam and memory foam. The good news is that you can ignore most of these terms. That's because mattresses are one of the few purchases that is purely subjective: The best mattress is the one that feels comfortable to you, experts say. "Most things you hear about mattresses are marketing hype," Tod Marks, senior project editor for health and family for Consumer Reports, tells DailyFinance. In fact, Consumer Reports -- perhaps the nation's most respected product-ratings source -- doesn't rate mattresses. That's because when the publication conducted a test in which a consumer group tried out an array of mattresses, it couldn't get a consensus. "Every model had its supporters and detractors...from the least expensive to the most expensive we tested," Marks says. ConsumerSearch.com, a product-review aggregator that compares ratings from experts and user reviews, also doesn't review mattresses for the same reason, Christine Frietchen, editor-in-chief of the site, tells DailyFinance. In turn, a pricey mattress -- and the cost can range from as little as $200 to thousands of dollars -- is absolutely no guarantee of comfort and quality, experts say. "There are no objective standards of excellence for [mattress] comfort," Marks says. Overall, a mattress should last you about eight to 10 years, and "all but the cheapest mattresses are apt to last about that long," Marks says. While finding the right mattress will ultimately come down to your unique comfort needs, it helps to know the basics. The most widely sold retail mattresses are innerspring mattresses, with Sealy (ZZC), Serta, Simmons and Spring Air ranking as the top sellers, according to Consumer Reports. This type of mattress is often the least expensive on the market. Some consumers find that innerspring mattresses keep them cooler than memory-foam mattresses, for example, and are more motion-sensitive, which is a consideration if you share a bed, according to ConsumerSearch. Meanwhile, memory-foam mattresses -- such as Tempur-Pedic models -- conform to your body and can help isolate you from motion on the other side of the bed, according to Consumer Reports. Doctors tend to recommend Tempur-Pedic mattresses for people with back problems, but some consumers have reported that memory-foam mattresses can be hot to sleep in, Marks says. By contrast, latex-foam mattresses have a reputation for keeping sleepers cooler, he says. Another option for partners is air-filled mattresses with two sides that can be adjusted separately for firmness. Select Comfort (SCSS) is a market leader in that category. Whatever mattress you choose, be careful not to throw away money on marketing hype. Be wary of cosmetic features such as "elegant weaves into the pattern or a bit of cashmere and wool," Marks says. "That's all a bunch of hooey." After all, Frietchen says, "you're going to cover it with sheets." By contrast, she says, you do want a mattress with a tight weave. "Loose stitching is a problem because it can unravel and allow the padding underneath to shift and create lumps." The best way to see if a mattress is right for you is to test it out. And because good mattresses can be found at both the low and high end of the price spectrum, it makes sense to start with the cheaper models in stores and work your way up in price, Marks says. If you find something you like among the less expensive models, "there is really no reason to buy something higher in the manufacturer's line," he says. Go to stores dressed to test. That means wearing comfortable (even pajama-esque) clothes. Then lie on the mattresses, without your shoes, for about 15 minutes total, spending about five minutes in each of your sleeping positions, Marks recommends. "It takes at least 15 minutes to relax enough to make an accurate judgment." Consumer Reports found that people who tested their mattresses before making a purchase ended up reaping more product satisfaction in the long run. While a higher price isn't synonymous with quality, avoid the absolute cheapest mattresses that some retailers advertise to lure you in the store, which can start as low as $200, Marks advises. Unlike other products, it's impossible to comparison shop for mattresses. "Stores deliberately sell 'exclusives' so that you can't compare prices from store to store," Frietchen says. A mattress is also one of the most heavily marked-up items available. So it's important to haggle to get a good deal. As a rule of thumb, you should never pay the sticker price, but aim for at least 50% off, Frietchen says. "This is one product for which you should just go for it," Frietchen says. "Don't worry that you'll be offending the salesperson. Be nice, but firm." In a study, Consumer Reports found that 72% of shoppers were successful in haggling down the price of a mattress, Marks says. 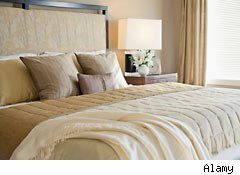 One exception: It might be tougher to haggle at retailers that sell their own brands of mattresses, such as Tempur-Pedic. "Price integrity is probably a little more important to them," Marks says. Also, be sure to tap seasonal sales. Mattress discounts jump during patriotic holidays such as Memorial Day, Fourth of July and Labor Day, Karin Mahoney, director of communications for the International Sleep Products Association, tells DailyFinance. You can shave several hundred dollars off the mattress price during these red-white-and-blue sales, she says. If a salesperson will not let you haggle down the price (assuming it's already on sale for at least 50% off the list price), try to get them to throw in some freebies. Consider asking for a free mattress frame or free removal of your old mattress from your home, Frietchen says. See if they'll throw in a free box spring or foundation, free pillows or free sheets. Also, negotiate the cost of delivery: Ask if some delivery dates or times are less expensive, if there's a discount for local delivery or if you can get a discount for picking up the mattress yourself, Frietchen says. If you're buying mattresses for your offspring, start with infant and toddler-designed models. "Crib and toddler mattresses don't cost more than $100, so it's not a big investment," Frietchen says. Consider a bed that your child can grow into after the toddler stage, Mahoney says. Likewise, when a child is ready for their "big kid bed," it makes sense to go with a full-size mattress -- one that they can grow into, but that they can safely move around in without falling out of, she says. Finally, look for retailers that offer "comfort guarantees," which give you the option to return a mattress if you take it home and discover that it's uncomfortable, Mahoney says. A comfort guarantee is different than a traditional warranty, which is designed to protect you against product defects.